Art Spells Magic is a children’s art class that has been running for over ten years. 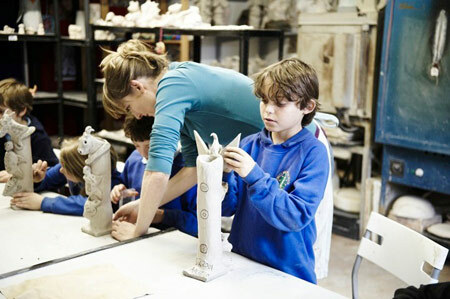 Here we teach children to perfect their artistic skills using many different mediums from clay, mono printing, lino cutting, painting on canvas, papier-mâché to name but a few. The student’s ages range from 4 years old to 16, some of which have been taught by Lucky for over 9 years. A few of the more experienced students also help teach the Saturday class. The artist studio atmosphere is very friendly, welcoming and vibrant, this helps inspire the children and creates the perfect setting for them to create. The studio also offers a safe environment with 24 hour security and also a drop off and pick up parking facility. The Art Spells Magic Kids Exhibition is a annual event which is held at the studio. Showcasing over 60 children’s work and covered by the local press, the exhibition is a fun filled day with fantastic art and light refreshments. It helps promote the student’s self esteem and they feel an enormous sense of achievement seeing their creations on display. The exhibition is a lovely day out for the family and a real celebration of the student’s creativity.